The federal government is taking an inventory of polio strains in labs around the country as part of an effort to prevent the virus from accidentally escaping and causing outbreaks once the disease is eradicated. 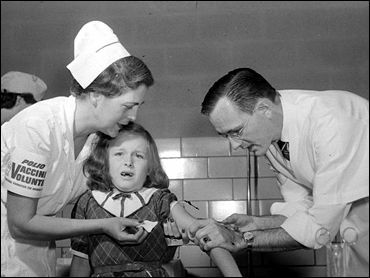 All 31,000 institutions that have polio virus stocks - including health departments, hospitals and private companies - have until Tuesday to submit a report to the Centers for Disease Control and Prevention. The CDC is also asking labs that no longer need to work with the virus to destroy any stocks they have. Slightly more than half of the 31,000 institutions have already submitted reports. Many have asked for extensions. Federal officials have said polio could be eradicated worldwide within two years. Health officials learned a lesson from what happened with the smallpox virus. That disease was eradicated from the world in 1977, but less than a year after the self-congratulatory ceremonies, two smallpox cases emerged from a lab in the United Kingdom. "When polio is eradicated, every effort must be made to ensure that wild polio virus is not similarly transmitted from the laboratory," the CDC said. Polio, which can cause paralysis and death, is not thought to be as dangerous as smallpox as a bioterrorist weapon because fewer than 1 percent of those infected with polio develop symptoms. People around the world also have been vaccinated against polio for decades. But the heightened focus on smallpox has made health officials much more vigilant about the polio virus inventory, said Dr. Donald Hopkins, associate executive director of the Carter Center in Atlanta and a former CDC deputy director. There are only 10 countries where polio is endemic, and last year there were fewer than 500 cases worldwide. The last U.S. outbreak happened in 1979.